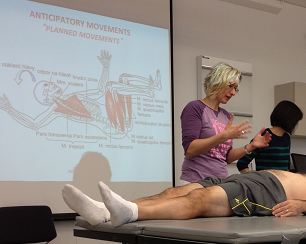 Dynamic Neuromuscular Stabilization Course "B"
The “Prague School of Rehabilitation and Manual Medicine” was established by keyneurologists/physiatrists, all of whom were giants in the 20th century rehabilitation era i.e. Karel Lewit and the late Professors Vaclav Vojta, Vladimir Janda & Frantisek Vele. Based on groundbreaking neurodevelopmental and rehabilitation principles by these men, Professor Pavel Kolar has successfully integrated the work of his predecessors in proposing the underlying neurodevelopmental mechanism for how the movement system develops hand-in-hand with CNS maturation. This complex approach is “cutting-edge” in that it provides a window into provides a window into the complexity and plasticity of the CNS and its effect on the movement system. The DNS approach can be used in the rehabilitation of a myriad of neurologic, musculoskeletal pain syndromes as well as performance athletic training. The nervous system establishes programs that control human locomotion that includes posture and movement. This critical “motor control” is largely established during the first years of life. Based upon the principles of neurodevelopmental kinesiology, i.e. the neurophysiologic aspects of the maturing movement system on which the Prague School was established, the scope of clinical rehabilitation options for many of our neurologic and musculoskeletal pain patients have been expanded. 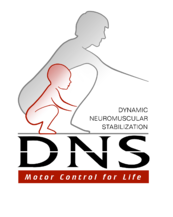 The DNS approach involves every component of the movement system (i.e. muscles, joints, nerves and soft tissue by stimulating movement control centers in the brain through activation of ideal inborn movement stereotypes. This, in turn helps restore the structural and postural alignment of the body’s neuro-musculo-skeletal system by evoking the global motor patterns. Global motor patterns form the foundation of human movement and represent genetically predetermined elements for uprighting and equilibrium. These patterns are essential for the control of posture and dynamic stability of the spine through the lifespan of the individual. Participants in this course will be introduced to the application of these principles. Demonstrate an understanding of developmental kinesiology and its relationship with pathology of the locomotor system: review and introduction to more advanced theory. Demonstration of babies: Be able to recognize ideal and disturbed locomotor patterns and determine developmental age of the babies. Demonstration of adult patients with pain in the locomotor system - stabilization assessment and treatment strategy. Postural analysis & testing of integrated spinal stabilization system - review of Course A tests and introduction to additional advanced tests. 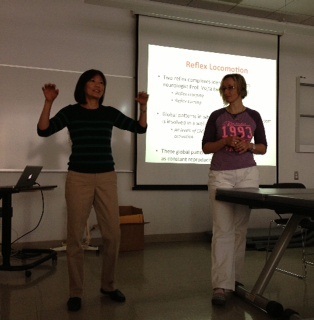 Reflex locomotion: Review of Reflex Turning I, II and reflex creeping and introduction to additional zones. Integration of corrective exercises based on newly taught DNS functional tests and RL positions. Introduction to cortical functioning - body scheme, quality of relaxation, isolated segmental movements. Provide more complex clinical management explanation for clinicians to better integrate more advanced DNS protocols into clinical practice. To optimally prepare students for the next level of training (Course "C"). DNS Course Requires Advanced Certification and skills and therefore is only available to the following Occupations: PT, MD, DO, DC, OT and ATC. Interested attendees must scan and email or mail proof of their advanced certification to bostonsmpg@gmail.com send directly to: 200 Freeman Street, #2, Brookline MA 02446. After review you will be sent a link to register or you may choose to register by mail and send proof of certification with your registeration. Besides paying the course fee above ALL prospective attendees must also register with DNS in Prague and pay an additional fee (80 Euro). Cancellation Policy: A partial refund of $600 will be given for complete registration cancellations made before Feb 15th, 2012. After Feb. 15th, a partial refund of $400 will be provided and cancellations made after March 15th will be provided a partial refund of $250. Cancellations after April 15th will not be refunded. A written letter requesting cancellation must be emailed to bostonsmpg@gmail.com. If you have any special needs that require additional assistance, please call us. Requests must be received at least two weeks prior to event date. The Boston Sports Medicine and Performance Group is recognized by the Board of Certification, Inc. to offer continuing education for Certified Athletic Trainers. This program has been approved for a maximum of 28 hours of Category A continuing education. Certified Athletic Trainers are responsible for claiming only those hours actually spent participating in the CE activity. Dr. Frank received her physical therapy degree from Northern Illinois University. She completed the Kaiser Permanente Orthopedic Residency program in 1993 while working on her Master of Science degree in Physical Therapy at University of Southern California. She received her post-professional doctorate degree from Western University of Health Sciences, Pomona, California 2004. She is a board certified specialist in Orthopedic Physical Therapy and a fellow in the American Academy of Orthopedic Manual Physical Therapy. Her clinical career has been greatly influenced by Shirley Sahrmann PT, PhD, and the Prague School of Manual Medicine faculty, namely, the late Vladimir Janda MD, Karel Lewit MD, and Pavel Kolar PT, PhD. *Besides paying the course fee above ALL prospective attendees must also register with DNS in Prague and pay an additional fee (80 Euro).